Si Gung Winokur started training in Tai Chi with Master Randy Li in April of 1990, and in June of 1990 started Wing Chun with Master Li as well. 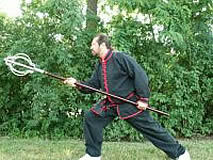 Si Gung Winokur continued with Master Li in group and private training until 1997. In 1999, Si Gung Winokur was recognized by Professor Yu Zheng Liu, 31st Generation Shaolin Temple and 8th Generation WuDang Disciple. The Professor gave Si Gung Winokur the Shaolin Temple name Xing Yong. 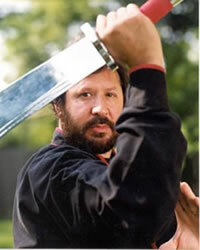 In 2000, Si Gung Winokur was recognized as a Fifth Generation Certified Instructor in Wing Chun by Master Michael Lam. (1) 5th Degree (Go Dan)Okinawan Shorin Ryu, (2) 5th Degree (Go Dan) Okinawan KoBudo Weapons, (3) 1st Degree (ShoDan)Nissi Goju Ryu, (4) 2nd Degree (Ni Dan) Black Rank American Tae Kwon Do, (5) Instructor Black Rank Chung Do Kwan Style Tae Kwon Do, and (6) Master Instructor Shimshon Krav Maga. 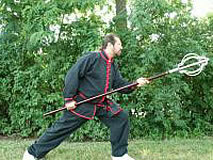 Master Winokur has knowledge of other Internal Chinese Arts, such as Chen, Wu, and Guang Ping Yang Style Tai Chi. As well as Xing Yi Chuan and Ba Gua Chang. Master Winokur has also written and had 6 articles published in various magazines, he has also been featured in several newspapers, and other publications see press/media page. In 2005 Master Winokur received certification as an (OBT) Oriental Bodywork Therapist. He is also a member of the College of Sports Medicine, and has worked with the MS (Multiple Sclerosis) Society, American Cancer Society, Strokes of Support, and the Special Olympics. Master Winokur also helps deliver Meals on Wheels for Seniors in the Greater Kansas City Area. Master Winokur has studied many of the Chinese Healing Arts including Herbal Healing and other related arts from various sources and in different increments of time he has learned: Anatomy, Physiology, Psychology, Sports Medicine, Chinese Acupunture/acupressure, Anmo, Tuina, Reflexology, Reiki, Bio-electric Body Balancing, Kineseology, QiGong (chi kung) Energy Healing and more. 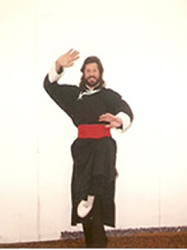 He also served as Director of Martial Arts, and created Tai Chi and Kung Fu programs for the Federal Reserve Bank of KC. He also has taught senior Tai Chi for Independence Parks and Recreation Department, as well as teaching Senior Tai Chi and White Willow Kung Fu at several local fitness centers. He has also taught many seminars and awareness workshops to womens groups, including practical Self Defense classes around the city for Free. Master Winokur has also instructed many law enforcement officers, Sheriff, Military/Military Police, as well as FBI agents. Si Gung Winokur also created S.O.S. Strategy Over Strength for Seniors, using Chi Kung (energy breathing, health maintenance exercises) and no-strength self defense and awareness techniques, which he has taught at hospitals, and senior centers in the greater Kansas City area. Si Gung Winokur is the Director and chief promoter of the National Golden Dragon Martial Arts Classic held annually in Kansas City Missouri (usually in the Spring) which is open to all styles and systems of Chinese, Okinawan, Japanese and Korean Martial Arts. Si Gung Winokur's students have won many awards in local, regional, national and international championships in forms, weapons, and sparring competitions. Si Gung Winokur was the Missouri Valley Association Director for the Amateur Athletic Union (AAU) Chinese Martial Arts, from his appointment in 1999 until June 2003, at which time he became the Regional Director of Missouri, Kansas, Arkansas, and Oklahoma, Region # 8 until 2008. He was a founding member of the Chinese Martial Arts Alliance, a founding memeber of Midland Union of Martial Artists (MUMA), he and his studio have been members of the United States Chinese Kuoshu Federation, he is a member of the American Teachers' Association of Martial Arts (ATAMA), and has been a member of the USA Wushu / Kung Fu Federation, and several National Shuai Chiao (Chinese Wrestling) Organizations. 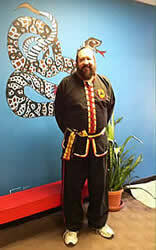 In March of 2007, Master Winokur was the first Kansas City instructor to be inducted into the USA Martial Arts Hall of Fame (Click Missouri and Kansas Flags). In 2012 Master Winokur was re-inducted into the USA Martial Arts Hall of Fame "Hall of Heroes" as Distinguished Chinese Martial Arts Master. In May of 2013 Master Winokur was presented with the Lifetime Achievement Award from the USA Martial Arts Hall of Fame, due to his commitment to serving the Martial arts Community and the public for more than 40 years. In 2015 Master Winokur was appointed Goodwill Ambassador of Martial Arts for Kansas City by the USA Martial Arts Hall of Fame. Currently, Si Gung Winokur is the president of the USA Xing Yong Chinese Martial Arts Association (USAXCMA) with several branch schools located in the Greater Kansas City area and also in outlying areas. He has also presented countless demos for groups and charity organizations. Sifu Winokur uses his knowledge to bridge the distances between styles and unite all martial artists for the common good.